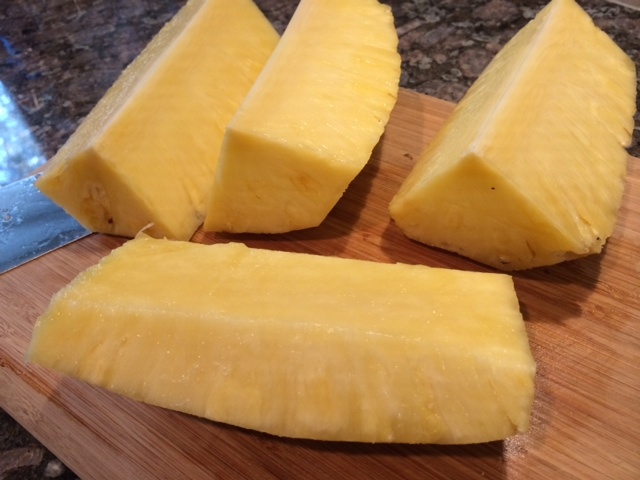 Not sure how to slice a pineapple? Click here for the how-to! Instead of wedges, slice the pineapple into two inch chunks and skewer for kabobs! Mix rum, brown sugar, honey, and orange juice together in a small bowl until the sugar dissolves. You may find it easier to turn the pineapple if it is threaded onto skewers. Or leave them as they are and turn carefully with tongs. Grill for about 10-12 minutes, turning & basting with rum sauce several times until grill marks form. Remove from the grill, plate on a serving tray, and serve to your delighted guests. This entry was posted in Dessert, Fruit, Side Dish and tagged brown sugar, Grilled, pineapple, rum. Bookmark the permalink.